From left to right: Zibusiso Gwebu, executive: strategy and business development at AYO; Bongi Radebe, executive: corporate development at Sizwe; Wallace Mgoqi, independent non-executive chairman of AYO; Naahied Gamieldien, acting CEO of AYO; and Hanno van Dyk, group CEO of Sizwe. 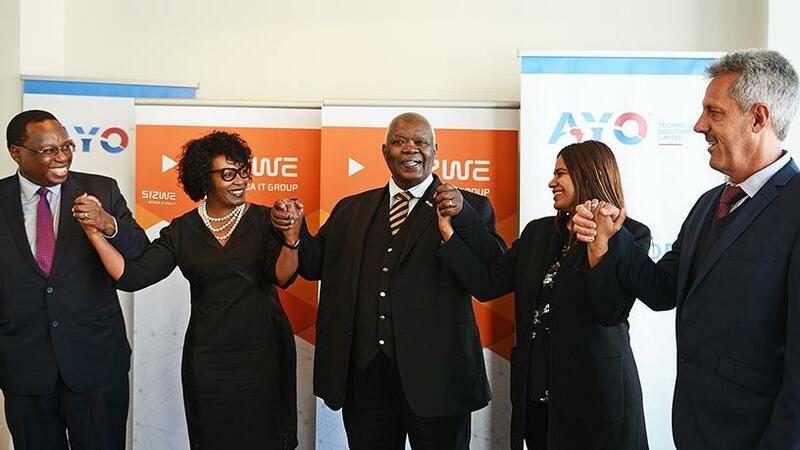 Although several high-ranking executives recently jumped ship from broad-based black economic empowerment ICT group, AYO Technology, the company yesterday announced it is acquiring a 55% equity stake in Sizwe Africa IT Group. The company says the transaction value for AYO is estimated to be R165 million for the 55% equity in Sizwe. It notes this acquisition is in line with AYO's go-to-market strategy and serves as further evidence of the company's resolve to implement the objectives of its strategic roadmap, which sees it continuing to significantly grow its underlying operations, assets and investments. It believes the investment in Sizwe is set to more than double AYO's revenue and significantly contribute to growing its bottom line. The group maintains its position as a rapidly expanding, innovative partner of choice for many leading organisations, it says in a statement. AYO is a broad-based black economic empowerment ICT group offering a number of end-to-end solutions to various industries. It was previously called Sekunjalo Technology Solutions and is a subsidiary of JSE-listed African Equity Empowerment Investments (AEEI). AYO listed in the computer services sector of the JSE in December 2017. Earlier this year, AYO announced it was looking to buy a 30% stake in British Telecoms South Africa (BTSA) from its parent company, for a subscription price of R990 million. However, on 6 August, AEEI issued a statement saying: "Shareholders are hereby advised that the subscription agreement has lapsed and that the parties are engaging with each other to have the [BTSA] agreement reinstated. Shareholders will be advised should the agreement be reinstated." Last month, Business Day reported that AYO Technology CEO, Kevin Hardy, and chief investment officer, Siphiwe Nodwele, had resigned from the company. AYO chief financial officer Naahied Gamieldien was named acting CEO until a permanent appointment is made. That same week, AYO announced the resignations of directors Khalid Abdulla, Walter Madzonga, Telang Ntsasa and Mbuso Khoza. They were replaced by Wallace Mgoqi, Dennis George, Sello Rasethaba and Rosemary Mosia. On 4 September, AEEI issued a statement saying company secretary Nobulungisa Mbaliseli had resigned and Damien Terblanche was appointed as the new company secretary. On the Sizwe deal, AYO says the business has a broad base of blue chip private customers and public sector customers with strong annuity-based income. It adds the business shows strong cash generation with cash from operations of around R75 million and EBITDA of R70 million for the year ending 30 June, and is expected to increase year-on-year. It is anticipated that AYO's investment in Sizwe will have a "payback" period of three to five years on moderate forecasts, and is estimated to generate over R1 billion in annual revenue with excellent operating and EBIT margins, says the company. The "payback" excludes the anticipated exponential capital appreciation from this investment. It is said Sizwe will significantly increase AYO's revenue, service and product offering, which will capture further market share and overall presence. Since its inception in 2001, Sizwe offers various ICT services to its customers, including a spectrum of physical infrastructure, metro and long-distance optic fibre, facility management, continuous energy supply, networking and security to hosting, storage server processing, mobility, data centre, end-user computing and associated consumables. Sizwe operates in four concentrated business units: managed services, unified network solutions; fibre and facilities management, and systems integration. "The transaction is significant for AYO with its additional estimated R1 billion annual revenue to the group, and is in line with its strategy to use group synergy to create stakeholder value through innovative products and services," says Gamieldien. She points out that Sizwe's business model directly complements that of AYO's, which will facilitate growth prospects within the AYO Group. Dr Wallace Mgoqi, independent non-executive chairman of the AYO board, remarks: "I am proud to confirm the transaction of AYO's acquisition of 55% of the equity into Sizwe, which is aligned with AYO's go-to-market strategy to deliver value for its stakeholders. The deal will also create scale within the AYO platforms, thereby broadening its customer base and presence. The transaction will also add long-term synergy and value in the businesses that we invest in." Group CEO of Sizwe, Hanno van Dyk, comments: "We are exceptionally proud to enter into this transaction and partner with AYO, and the future prospects for the Sizwe/AYO partnership look brighter and we are very excited by the transaction. Sizwe's commitment to its transformation strategy is echoed by the transaction with AYO. "After five years of remarkable organic growth, Sizwe is now focused on the next level of development with our product, services and synergy with AYO. This transaction will see Sizwe move to become a majority black-owned company."